This is beautiful sweet poetry for any tourist to see and read: “Free wifi”. #tokyo Update to the JapanesePhotos Instagram at: http://bit.ly/2j3MGt1. A young Japanese lady at Tokyo’s iconic Sensoji Temple, with Tokyo Sky Tree in the background. The Tokyo Olympics and Paralympics in 2020 are seen as a potential cash cow, despite no city since the 1984 Los Angeles Olympics had ever been able to turn a profit. However, financial success is what is hoped, and that depends on getting tourists into Japan before, during, and after the Olympics. It also depends on tourists’ willingness to spend, and spend often. However, no one wants to spend money on things they are uncertain about. Currently, I have seen very little action or plans made to make it easier for tourists to Japan to spend, spend big, and spend often. Admittedly, some dodgy Japanese companies have made tracks into providing “free” wifi around the place. Better connectivity is meaningless, if tourists have no good or useful information to access. Here are five things that Japan must fix. A young American lady leaving a restaurant in central Nagoya. The Nagoya City Art Museum provides the perfect example of everything wrong with Japanese webdesign thinking. The Japanese version of the site is informative, interesting, updated, and provides news on what’s coming up. The “English website” provides a generic pdf document providing general information that is uninteresting, and suggests there’s nothing special here. This type of “English website” is sadly common. One vineyard in Shizuoka provides their “English website” link, which takes you to Rakuten; however, it only provides hotel booking forms, and all information about the attached winery is noticeably absent. Speaking of noticeably absent, and that’s English on Google Maps. Toyota Car Rental is one guilty example; see this Kyoto example, zoom in a little bit more so you don’t confuse it with another rental agency. You can book a car on their English website, but find where the shop is on Google Maps? Nope, unless you can read Japanese. This is sadly common practice for hotels, temples, and other key tourist sites. Another point regarding absence, are English websites. For instance, Japan Today has this page on “onsens” (hot spring resort hotels). The resorts listed here are in English, but after clicking on the link, you are often taken to a Japanese-only webpage, which is of zero value to international guests, and may appear to some guests as exclusionary. Try Hazu Gassyo for instance. Have you ever heard of things like sundubu, chodofu, mulnengmyun? Two of them are my favourite Korean foods, and one is Taiwanese, but distinctly smelly. Of course, you know them right? Who doesn’t love a nice bowl of mulnengmyun on a hot summer’s day, right? Fortunately, I will give you some meaningful translations of these: spicy tofu soup, stinky tofu, and icy noodle soup respectfully. However, Japanese are oblivious to this. Japanese assume you will understand words like okonomiyaki, takoyaki, ika, and so forth. It’s obvious to them, so when it’s written in the Roman alphabet it magically becomes English, and so apparently we can understand these. There needs to be a push to actually provide meaningful translation for Japanese menus. However, I suspect that Japan will attempt at solving a simple problem with overly complex technology. I’m sure someone will say, “Hey, let’s make a translation app”, and it will provide non-nonsensical output. Already, some Japanese restaurants don’t use waiters, but have a machine near the front door with a computerised menu. You push the buttons for the food you want, get some tickets, give the tickets to the lady, find a seat, and wait for the food come. Sounds simple, right? Wrong. Such computerised menus are provided in only Japanese, and no other language. Also, typically, no one can provide quality help. The famous Nagoya-based JR Central bullet trains at Tokyo Station use non-English terms in the Roman alphabet. Similarly, JR trains need to address this issue too. You obviously can tell the difference between the “hikari”, “kodoma”, “shinkansen”, “nozomi”, and “Green Car”, right? Well, here’s a very important tip, “Green Car” does not mean an environmentally friendly benefit, it’s code for “1st class” or “premium”. 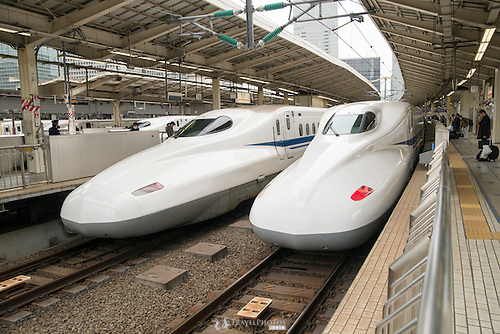 Also, just so you know, “shinkansen” means bullet train, and the other words mean the different types of bullet trains, ranging from local (kodama), express (hikari), and limited express (nozomi, requires an additional ticket). See Wikipedia for more info. 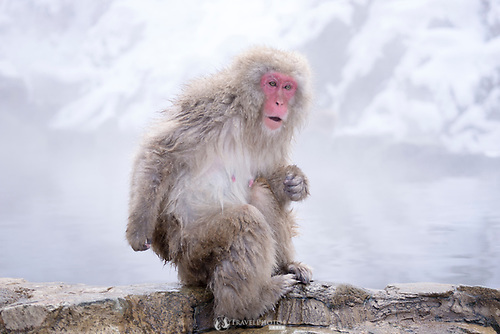 Many Japanese tourist spots advertise themselves on Japanese websites like Rakuten. However, no one outside of Japan uses Rakuten. Rakuten bills themselves as an outward looking international company, but in fact, they’ve only ever made waves here in Japan. They have no effective presence outside of Japan, and have even closed some of their European offices. I’ve only ever booked a hotel once on Rakuten, only because that area does not use international websites like hotels.com. When travelling through many countries, it is far easier to use a few familiar websites like hotels.com, Tip Advisor, Google Maps, and others. These are international multi-lingual websites. Users have become accustomed to using them, and it’s easier to keep using the same website, rather than finding a new one that may or may not be good or complete, and having to learn how to use their system. But most Japanese tourist spots are not aware of this. They only advertise on local websites believing it to be the best. In fact, if a tourist site does appear on Trip Advisor, typically there is little or no meaningful information. For instance, how much useful information can you get from this Trip Advisor entry? Similarly, there’s often missing information on Google Maps or it’s only in Japanese. Having no or little English information makes the tourist site appear to be a poor outfit, with little to offer. 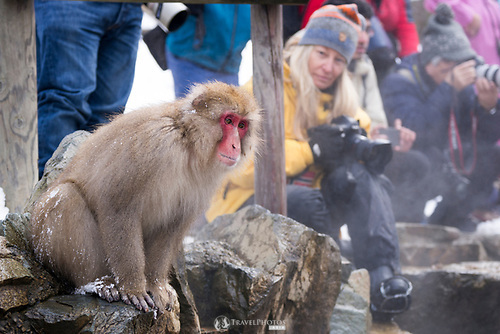 Consequently, foreign tourists look elsewhere for places to go. Providing lots of information on important websites is key. Better still, multi-lingual information. For many Japanese people, when they think of travel, they think with their stomachs. They want to see things that they can post on Line or Twitter, which is evidence that they’ve done something interesting. So, architecture and pictures of food are important. However, Westerners don’t think like this. In addition to architecture, many Westerners may prefer experiences such as doing a tea ceremony, seeing a ninja show in Iga, experiencing a theme café, and such. These things are far more memorable than a plate of food. However, many Japanese hotels front-line their restaurants as being the main attraction (example on Hotels.Com). And honestly, to me, often the food does not look appealing, especially with the poor quality of photography often used. In short, what is missing is actual research on what foreign tourists want. Food is a big part of Japanese people’s travelling experiences. 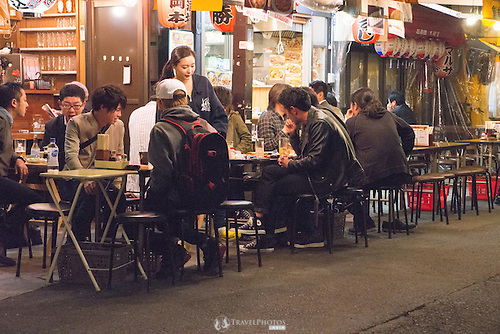 People eating at a restaurant near a major tourist site in Tokyo. Kyoto is a great city. I love it. In Kyoto, you have to take over-crowded buses on over-crowded streets to get anywhere. Also, everything in Kyoto requires a lot of walking. You are guaranteed to end the day worn out and foot-sore. I cannot stress enough how important it is to raise your fitness levels and to have comfortable walking shoes for Kyoto. Additionally, there are no park benches anywhere. If you want to sit down and have some water from your own bottle, you have to sit on the ground. No one in Japan sits directly on the ground. Instead, you’re expected to go to a cafe and spend. This makes the Kyoto experience more grueling and more tiring than it has to be. For couples, the hotels are a barrier. Last year I saw some hotels saying “women only”, which means in a small city like Kyoto in the last few weeks before your travels and all other rooms are booked out, there’s no where for a man to stay. In addition, twin beds. That means, couples cannot share a bed, but expected to live like strangers in two separate single beds (like this hotel again on Hotels.Com). This might be fine for Japanese travellers and couples, but this spoils the romantic experience for non-Japanese couples. Semi-double beds maybe too small for many foreign couples, and normal double beds are very rare or over the top expensive. Trainee tour guides in Kyoto. 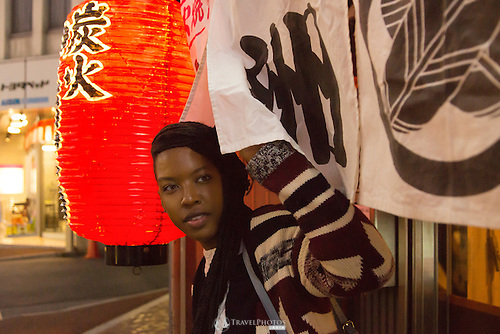 Travelling through Kyoto involves an immense amount of walking, but nowhere to rest. Of course, the list could be longer, but these are just some of the key points that stand out to me. A lot of the issues does seem to be language related. The Japanese education system emphasize test performance, but not actual communication. 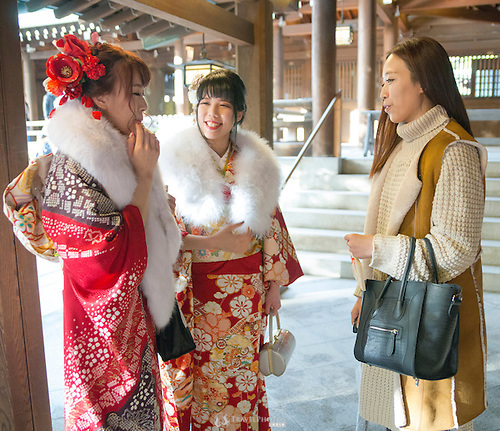 Consequently, it’s no surprise that tourist communication is a weak point of the Japanese tourist industry. Finally, an alternative way of viewing these five “problems” is that they are not problems at all. Instead, these contribute to a genuine travel experience akin to what early explorers might have had, albeit, in a modern age. Like many tourist shops in Kyoto, this kimono rental store offers only limited and fragmentary information in English, and maybe none in Chinese. 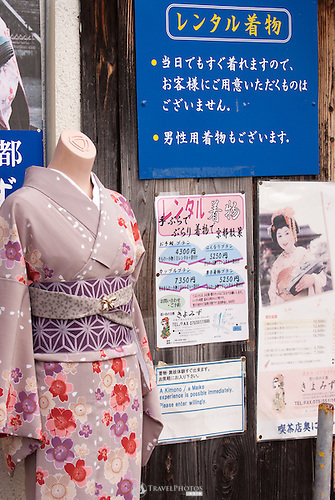 For information on how to rent a kimono in Kyoto, see this kimono rental blog post.